The current building was erected after the previous rectory burnt down in 1935; see Fires and Floods. It functioned as a Rectory until the late 1970s when it was sold by the Diocese to the Burgess family. John Horden (cousin of the actor Michael Horden) from 1962 to 1971. Joan and Sidney William Goodman (the last Rector of Wold Newton - and the last resident priest) from 1971 to the late 1970s. Ann and Terry Burgess and their children Simon and Ben from the late 1970s to the mid 1980s. Carmen and Martin Riggall and their children William and Paula from the mid 1980s until 1994. 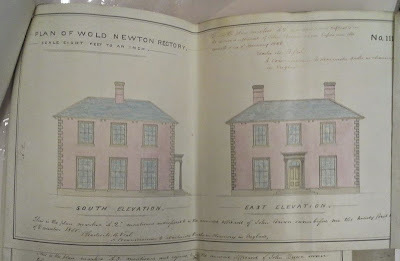 The Lincoln Archives contain plans for the previous rectory: Archive reference DIOC/MGA/384. MGA is a “Mortgage under Gilbert's Act” which, in this instance, is between Charles Langley Maltby, Rector of Wold Newton 1854-59, and the Commissioners of Queen Anne's Bounty for the funds to build a rectory, and contains the plans and specifications for the building, which should have been completed by 1856. 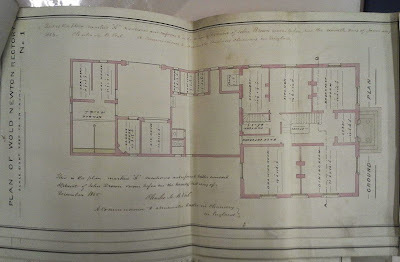 However there are letters within the archive from the subsequent rector, George Wingfield Bourke, to the builder, John Brown of Grimsby, referring to his viewing the plans in 1859, which appear to show that he was the first to move into it. The plans show that the current stables/garage are remnants of the original building. It was a curious arrangement to have the wall between the main reception rooms bisecting the middle south window! As part of the mortgage paperwork, the Bishop issues a form of enquiry to the Rural Dean, Rev John Posthumus (yes really!) Parkinson at Ravendale, and two other priests, Woodthorpe Johnson at Grainsby, former curate at Wold Newton, and Basnett at Waltham, (father of Francis Iles' wife of the Manor, also being rebuilt by Yarborough's at the same time for the Iles to move into, the old Manor being all but derelict, so the Iles were living in Waltham), to ascertain whether any reparations should be sought from previous incumbents for dilapidations to the previous parsonage! For some reason they confirm that it would not be possible to do.